Fantasy mermaid art is an oxymoron since mermaid art is necessarily fantasy art. When I first made these pictures I did not want to get too crazy. I didn't want to have mermaids floating about in space suits. I decided to go in another direction. One of my favorite TV shows is "America's Next Top Model". I know what you are going to say "Of course, he's a man and he enjoys looking at beautiful, young models". Well, that is true but there's more. Something about the show fascinates me. I think because the show takes the girls from real to fantasy. As the show progresses they learn to look and behave like models. They become a fantasy of beauty. It was this type of fantasy I wanted. This picture is very elegant. The background reminds me of the décor of a fashionable and very expensive restaurant. The girl appears however more flirtatious than hungry. The first image here uses a combination of blue and purple tones. A light pink in the background brings out the girl's complexion. My idea here was an arty mermaid fashion shoot. 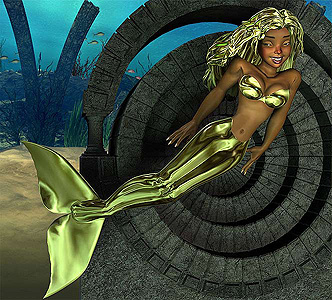 This last image stresses the fantasy part of fantasy mermaid art. The girl is more lively and fun-loving here. I used the same gold texture map for her tail, top and hair. It was primarily the hair that interested me at the time. I probably could have done more with the picture as a whole than I did. Click here for more of my fantasy mermaid art.